At the end of 2015 is the beginning story of my journey to learn and plunge into the world of blogging. At that time Pak Pandani blog is one of the media I learned about blogging. This blog named Pak Pandani is a personal blog owned by a man named Irfan Dani S.pd and is a Civil Servant. Mr. Pandani comes from Pariaman, Padang, West Sumatra. Besides as a lecturer, Pak Pandani proved to have a hobby blogging as well. 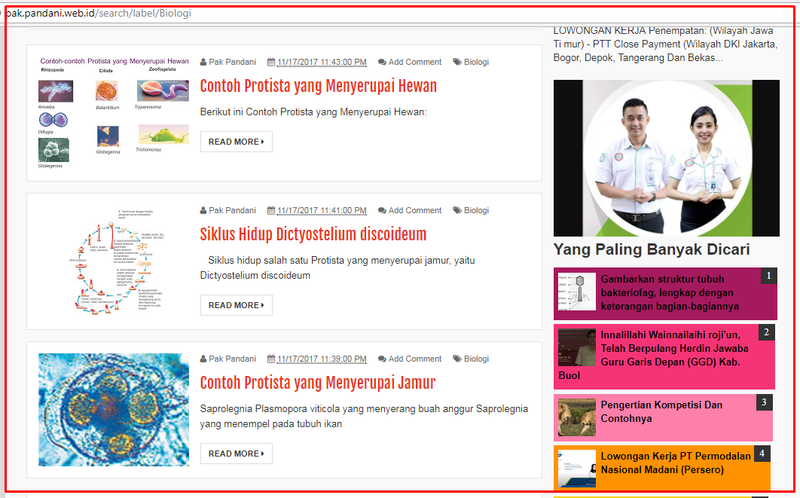 Blog Pak Pandani is an educational themed site but in the content is also an article about blogging tutorial. From learning tutorial on Pak Guru's blog, I started to know how to edit menu, edit template. Even looking for and installing templates I also learned from the blog. In the year 2015 Pageview Pak Pandani blog is still about a hundred thousand more and now it has reached the number of five million more. Truly extraordinary blog visitors. The number of posts that have been loaded is also very much that is a number of 3576 articles. All articles written not all contain school lessons but there are also common themes such as job info, tricks, and Downloads. From this Pak Pandani blog, I know many ad service providers like Adfly, Load IN, BaseCame, Access trade, revenue hits and many more. And I have tried many to be an advertiser publisher promoted by Mr. Pandani but did not get satisfactory results. When I was a fan in 2015 the blog has not become a publisher of Google Adsense ads. Then around the year 2016 Blog Pak Pandani finally officially became publisher Ads Adsense. But eventually, Google Adsense account hit Banned in September 2016. Until now I see there are no Adsense ads on the blog that means Google Adsense account exposed banned forever. Looks like the source of income from Pak Pandani's blog now is from Adnow Ads. To be an Adnow ad publisher I've tried it on the Pedia Asik Blog, but because my blog traffic is so small at that time that it does not make any good money. Blog Pak Pandani is a blog that raises me as a blogger so not so easy to forget it just like that.